Tip #1302 – Using SalesRep/ZipCode Maintenance to make adding customers even quicker and easier! A new feature has been added which allows you to assign sales reps by zip code ranges. This feature will automatically assign the sales rep when adding a customer if the zip code has been assigned to a sales rep in the Sales Rep/Zip Code Maintenance screen. Jim Black is responsible for all customers in Kentucky (zip codes 40000-42999). Let’s look at how simple it is to set up this zip code territory for him. 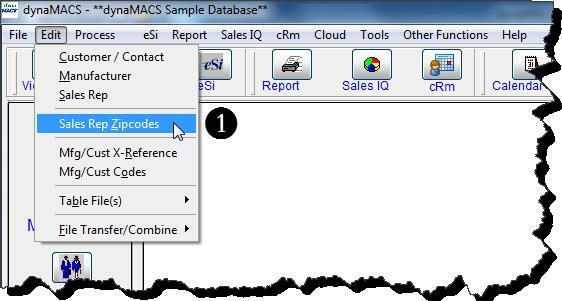 Select Edit and Sales Rep Zip Codes from the dynaMACS main screen menu options to get to the SalesRep/ZipCode Maintenance screen. To review the records set up in SalesRep/ZipCode Maintenance you can select the arrow buttons in the lower left hand corner of the screen. 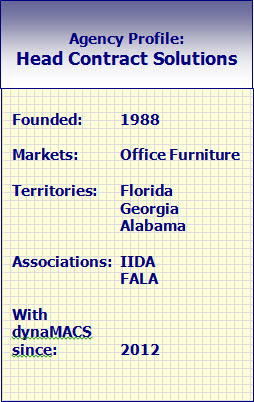 = Brings you to the first SalesRep/ZipCode record. = Brings you to the last SalesRep/ZipCode record. 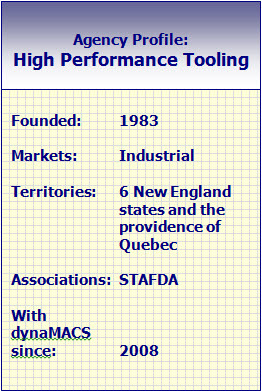 = Brings you to the previous SalesRep/ZipCode record. Once the zip codes and sales rep assignments have been entered into SalesRep/Zipcode Maintenance the sales rep will be automatically assigned when entering new customers in Customer Maintenance. In the following example a new customer is being added in Customer Maintenance using the zip code 45222. After entering the zip code and selecting the <Tab> key or the <Enter> key, you will see that the Sales Rep field is automatically populated with Jim Black (JB) because he is assigned in the SalesRep/Zipcode Maintenance table. http://www.dynamacs.com/wp-content/uploads/EmpoweringdynaMACS_Logo-Vertical.png 0 0 dynaMACS Software http://www.dynamacs.com/wp-content/uploads/EmpoweringdynaMACS_Logo-Vertical.png dynaMACS Software2013-02-28 08:26:232017-07-25 16:59:09Tip #1302 - Using SalesRep/ZipCode Maintenance to make adding customers even quicker and easier! Ellis came across dynaMACS at a trade show, and was impressed with the level of in-depth information the software provided. Data could be accessed instantly, and he could drill down to in-depth information with just a few mouse clicks. So the agency purchased dynaMACS, and the challenge of getting lightning-fast access to valuable information was solved. High Performance Group partners have dynaMACS Mobile, so they can take sales and commission data with them wherever they go – and still quickly call for technical support. After being in business a little over a year, and with sales growing, it quickly became clear that The Ranger Group needed software for tracking commissions, analyzing sales and paying reps. “We were trying to use Excel spreadsheets, but it wasn’t providing the depth of information, or the flexibility we needed. Sales analysis was merely a by-product of accounting,” says Partner Bob Flint. In addition, sales reps did not have timely, reliable and in-depth data on customers and manufacturers, which was inhibiting sales and account management. Flint was introduced to dynaMACS at a trade show, where he saw a demo of the software and decided it was just what the agency needed. Since purchasing dynaMACS, top sales reps at The Ranger Group are now equipped with dynaMACS Mobile, so they always have the most recent sales and commission data on the road with them. Rather than preparing individual reports for reps, dynaMACS mobile eliminates the work and automates the process. In fact, dynaMACS Mobile is so beneficial, The Ranger Group purchased dynaMACS Mobile for three more of its sales reps. “It’s a big help to have up-to-date information before walking into a meeting with a customer,” Flint says. Manual tracking processes and cumbersome spreadsheets are a thing of the past. The Ranger Group has easy access to higher levels of data intelligence, which enables them to serve manufacturers better. “Rather than being rows in a spreadsheet, our sales and commission data is transformed into meaningful information. I would recommend dynaMACS to anyone. dynaMACS lets us communicate better with our manufacturers and customers, improving our value to both,” Flint says. If you receive sales information from manufacturers electronically, you can replace hours of data entry by importing that information directly into dynaMACS using the optional Electronic Sales Input (eSi) module. 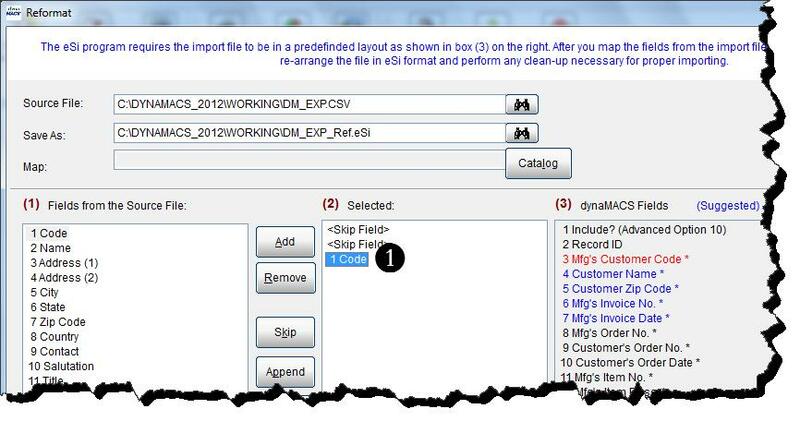 eSi includes the Reformat Utility which translates the information from your manufacturer into a file that dynaMACS recognizes. Once you have shown dynaMACS how to translate a manufacturer’s file the first time, dynaMACS remembers the translation, or map, for any future sales information files received from that manufacturer. Below are just a couple of eSi features that show the power of eSi mapping. The Advanced feature #11 says Auto Duplicate any fields in the import file if the row is blank. This will apply to all dynaMACS fields in Column 3 that have an “*” next to them. 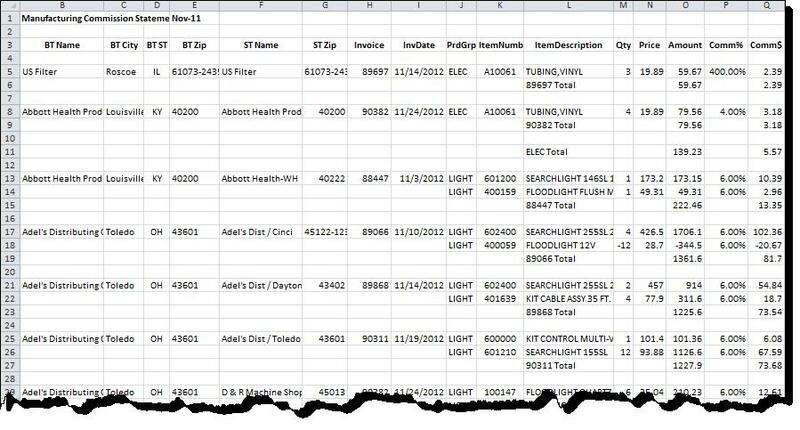 The spreadsheet example shown below is a primary example of where this can be used. Notice the first entry for each invoice has the permanent information but each subsequent row is left blank. By selecting the Auto Field Duplication option, the blank fields will be populated with the preceding data. 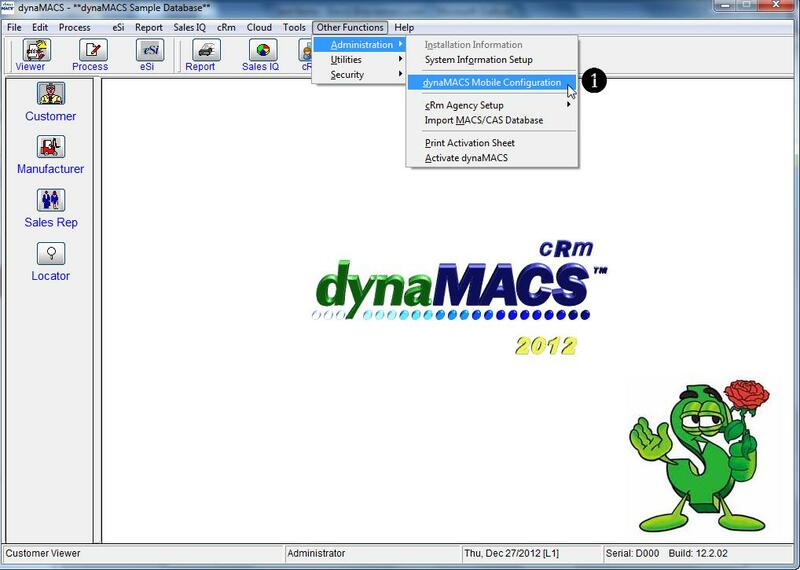 This eliminates the need to manually modify the spreadsheet prior to processing it in dynaMACS. With the Append feature you can combine two fields from your import file to map to a dynaMACS field. This is useful in identifying multiple Ship-to locations for a customer where the Ship-to location is in a different field from the Sold-to customer code. In the following example we will append the Code field with the Zip Code field. First highlight a field in box (2) Selected. Next highlight a field in box (1) Fields from the source file which will be appended to the field selected in step 1 and select the Append button. The field Code is now appended with the field Zip Code. 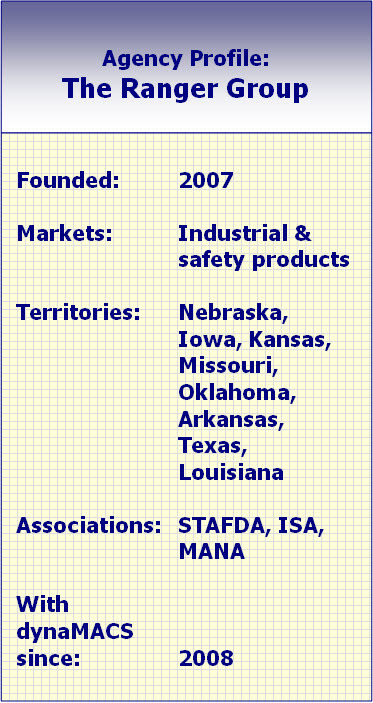 The combined field is “mapped” to the Mfg’s Customer Code used to identify the correct customer. If you are interested in the dynaMACS eSi module and you currently do not have access to it, please contact the dynaMACS sales office @ 800-321-1788 to learn more. Case Study: Head Contract Solutions, Inc.
Head Contract Solutions was expanding, hiring new sales reps, and trying to use Excel for sales and commission data. The agency needed deeper information than Excel could provide. So a hunt for new software commenced. Although hindsight is 20/20, the agency based its software decision mostly on price. It turned out to be a case of “you get you pay for.” Liz Head, owner and manager of Head Contract Solutions, described the software as “grueling.” It was not easy to learn or to use and the agency still wasn’t getting the in-depth data they sought. Using the software was making the agency less productive, instead of more. And so a second software search began. This time, Head Contract asked colleagues at other sales agencies what software they used. One name came up time and again: dynaMACS. Head says dynaMACS makes it easier to pay sales reps, and she finds being able to access a 5-year sales history with a few mouse clicks extremely useful. http://www.dynamacs.com/wp-content/uploads/EmpoweringdynaMACS_Logo-Vertical.png 0 0 dynaMACS Software http://www.dynamacs.com/wp-content/uploads/EmpoweringdynaMACS_Logo-Vertical.png dynaMACS Software2013-01-07 15:38:002017-07-12 09:17:57Case Study: Head Contract Solutions, Inc.
Dropbox helps you store files and access them any time wherever you are. Using Dropbox with dynaMACS will eliminate the need for sending and receiving your dynaMACS files via email. Dropbox creates a special folder on all your devices. Any time you need to save a file, drag it into the folder and at a blink of an eye it will appear in the same folder on all the other devices, be it laptops, PCs, mobile phones or tablets. For more information on obtaining a Dropbox account visit their website at www.dropbox.com. To save dynaMACS Mobile files to Dropbox you must set up each dynaMACS Mobile user configuration to save these files to a Dropbox folder. 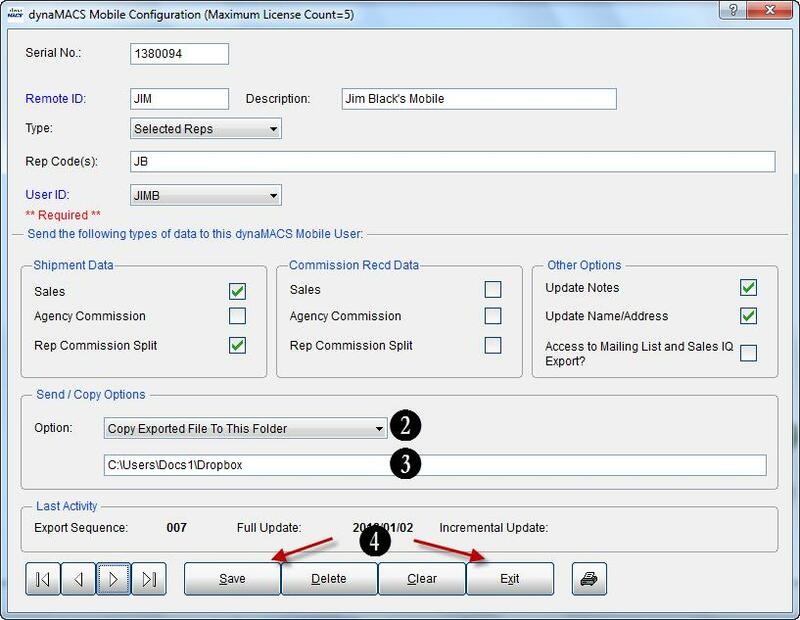 From the main dynaMACS screen select Other Functions>Administration>dynaMACS Mobile Configuration to open the dynaMACS Mobile Configuration screen. Select the Save button then the Exitbutton. Since your agency file is sitting in a Dropbox folder, there is no longer a need to receive it via email and copy it to a folder on your computer before importing. You can go directly to the Dropbox folder during the Import Agency File process. 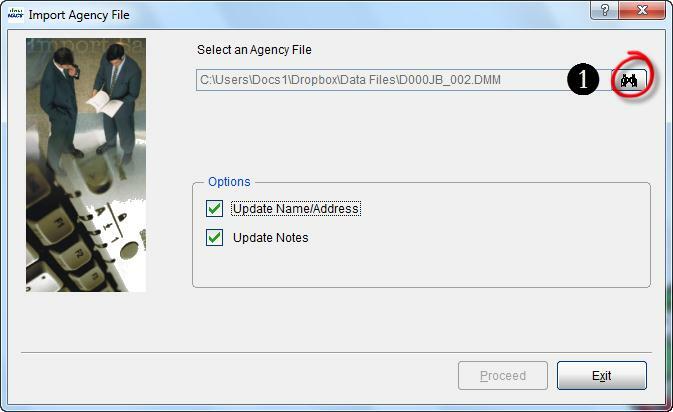 From the Import Agency File screen select the Binoculars button to locate the agency (.DMF) file in the Dropbox folder and proceed with the import.